Nobody wants pests in their garden. It doesn’t matter if you’re growing vegetables you hope to eat or flowers you love to admire. Seeing your precious plants, and your hard work, destroyed before your eyes can be an extremely frustrating experience. Most people quickly resort to insecticides to try to get rid of pests they find, but this is not always the cleanest, safest, or even best way to keep your garden humming along happily. Many times, the best way to deal with pests is to be proactive and keep the problem from getting out of control in the first place. One very effective, and natural, way to deal with common garden pests is to actually introduce beneficial insects to the area. There are several insects that have proven to be a great help to gardeners. They will live among your plants, patrol regularly, and guard against damage and infestations from some of the worst garden destroying pests. You can either try to attract these beneficial bugs yourself, or buy them from garden centers or gardening catalogs. These three insects are known for preying on leaf-eating caterpillars. They are attracted to carrots, parsley, celery, caraway and Queen Anne’s lace. What actually attracts them is the flowers of these plants, so it’s important to make sure they are left long enough to produce flowers. 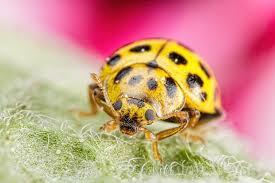 Ladybugs are very common in most areas and will prey on aphids, mites, whiteflies and scale. Any flowers in the daisy family will help attract them to your garden. You can also plant tansy and yarrow. They are also commonly found for sale in garden catalogs and stores. Lacewings are known to be good predators of aphids. Their larvae will also consume the larvae of other pest insects they might come across. They are attracted to composite type flowers such as black-eyed susans, asters, yarrow and goldenrod. Lacewings are another insect that is commonly found for sale from garden specialists. Hoverflies are another species that is very well known for their taste for aphids. Their behavior and tastes are very similar to lacewings. Their larvae will feed on other insects and insect larvae in the garden and they are also attracted to the same types of flowers. Having both the hoverflies and lacewings present can make it extremely difficult for other insects to reproduce as their larvae will be under constant attack. 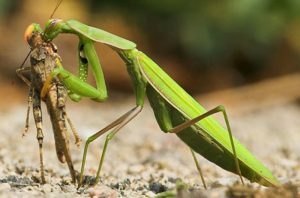 The praying mantis is a fairly well known large insect. If you’re the squeamish type who really doesn’t want to see the insects in your garden, they may not be for you. They do, however, eat a large variety of pest insects and can do a great job of keeping populations under control. Praying mantis eggs can be ordered online or through gardening catalogs. Simply place the eggs throughout your garden and allow them to hatch. They will grow quickly and get to work protecting your plants. For the best line of defense, having several different types of beneficial insects in the garden area works. Try introducing or attracting a few different species and nature will eventually take over and allow the best performers for your particular situation to flourish and keep everything under control. In no time at all you can have a pest free garden without the need to resort to toxic or dangerous chemicals! Every spring my garden gets eaten alive by pests and then the spiders come to take them out all summer. This year I refuse to let it happen again. I am bookmarking this article to use when the spring gets here thank you!